1.3 2008–2010: Evolver and Wake Up! Legend was born on December 28, 1978, in Springfield, Ohio. He is one of four children of Phyllis Elaine (Lloyd), a seamstress, and Ronald Lamar Stephens, a factory worker at International Harvester. Legend was homeschooled by his mother. At the age of four, he performed with his church choir. He began playing the piano at age seven. At the age of 12, Legend attended Springfield North High School, from which he graduated salutatorian of his class four years later. According to Legend, he was offered admission to Harvard University and scholarships to Georgetown University and Morehouse College. He attended the University of Pennsylvania, where he studied English with an emphasis on African-American literature. While in college, Legend served as president and musical director of a co-ed jazz and pop a cappella group called Counterparts. His lead vocals on the group's recording of Joan Osborne's "One of Us" (written by Eric Bazilian of The Hooters) received critical acclaim, landing the song on the track list of the 1998 Best of Collegiate a Cappella compilation CD. Legend was also a member of the prestigious senior societies Sphinx Senior Society and Onyx Senior Honor Society while an undergraduate at Penn. While in college, Legend was introduced to Lauryn Hill by a friend. Hill hired him to play piano on "Everything Is Everything", a song from her album The Miseducation of Lauryn Hill. During this period, he began to hold a number of shows around Philadelphia, eventually expanding his audience base to New York, Boston, Atlanta, and Washington, D.C. He graduated from college in 1999, and thereafter began producing, writing, and recording his own music. He released two albums independently; his self-titled demo (2000) and Live at Jimmy's Uptown (2001), which he sold at his shows. After graduating from the University of Pennsylvania, Legend began working as a management consultant for the Boston Consulting Group. He subsequently began working on his demo and began sending his work to various record labels. In 2001, Devo Springsteen introduced Legend to then up-and-coming hip-hop artist Kanye West; Legend was hired to sing during the hooks of West's music. After signing to West's label, he chose his stage name from an idea that was given to him by poet J. Ivy, due to what he perceived as an "old-school sound". J. Ivy stated, "I heard your music and it reminds me of that music from the old school. You sound like one of the legends. As a matter of fact, that's what I'm going to call you from now on! I'm going to call you John Legend." After J. Ivy continued to call him by the new moniker "John Legend", others quickly caught on, including Kanye West. Despite Legend's reluctance to adopt a stage name, he eventually announced his new artist name as John Legend. Legend released his debut album, Get Lifted, on GOOD Music in December 2004. It featured production by Kanye West, Dave Tozer, and will.i.am, and debuted at number 7 on the US Billboard 200, selling 116,000 copies in its first week. It went on to sell 540,300 copies in the United States and was certified gold by the RIAA. An international success, Get Lifted also reached number one on the Norwegian Albums Chart and peaked within the top ten in the Netherlands and Sweden, resulting in worldwide sales of 850,000 copies. Critically acclaimed, it won the 2006 Grammy Award for Best R&B Album, and earned Legend another two nominal awards for Best New Artist and Best Male R&B Vocal Performance. Altogether, the album produced four singles, including debut single "Used to Love U", which entered the top 30 of the New Zealand and UK Singles Chart, and Grammy Award-winning "Ordinary People" which peaked at 24 on the Billboard Hot 100. John Legend also co-wrote Janet Jackson's "I Want You", which was certified platinum and received a nomination for Best Female R&B Vocal Performance at the 47th Annual Grammy Awards. In October 2006, Legend's second album, Once Again, was released. Legend co-wrote and co-produced the bulk of the album, which saw him reteaming with West and will.i.am but also spawned production from Raphael Saadiq, Craig Street, Sa-Ra, Eric Hudson, Devo Springsteen, Dave Tozer and Avenue. Released to major commercial success, it reached number three on the Billboard 200 and debuted on top of the Top R&B/Hip-Hop Albums chart. It was eventually certified platinum by the RIAA, and reached gold status in Italy, the Netherlands, and the United Kingdom. At the 2007 Grammy Awards ceremony, the song "Heaven" was awarded the Grammy Award for Best Male R&B Vocal Performance, while lead single "Save Room" received a nod in the Best Male Pop Vocal category. Legend won a second Grammy that year for "Family Affair", a collaboration with Sly & The Family Stone, Joss Stone and Van Hunt, for the former's Different Strokes by Different Folks album. In January 2008, Legend sang in a video for Barack Obama, produced by will.i.am called "Yes We Can". The same year, Legend had a supporting, singing-only role in the 2008 movie Soul Men, where he plays the deceased lead singer of a fictitious soul group that includes Samuel L. Jackson and Bernie Mac. In October, he released his third studio album, Evolver. Speaking about the reasons for calling the album Evolver, he stated: "I think people sometimes come to expect certain things from certain artists. They expect you to kind of stay in the same place you were at when you started out. Whereas I feel I want my career to be defined by the fact that I'm NOT gonna stay in the same place, and that I'm always gonna try new things and experiment. So, as I think this album represents a manifestation of that, I came up with the title 'Evolver'." The album was preceded by dance-pop-influenced uptempo single "Green Light" which featured rapper Andre 3000 of OutKast and became his highest-charting single since "Ordinary People"; it was also released for the Grammy Award for Best Rap/Sung Collaboration. On March 30, 2008, Legend performed in front of a sold out crowd of 74,635 in the Orlando Citrus Bowl, now known as Camping World Stadium, for WWE's Wrestlemania XXIV. 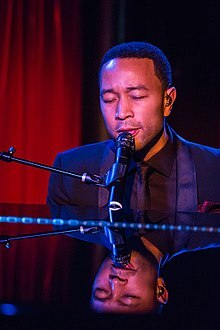 On July 5, 2011, songwriter Anthony Stokes filed a copyright infringement lawsuit against John Legend in United States District Court in the District of New Jersey, alleging that Legend's song "Maxine's Interlude" from his 2006 album Once Again derives from Stokes' demo "Where Are You Now". Stokes claimed he gave Legend a demo of the song in 2004 following a concert at the University of North Carolina at Chapel Hill. Legend denied the allegations, telling E! Online, "I never heard of his song until he sued me. I would never steal anyone's song. We will fight it in court and we will prevail." However, nearly 60,000 people took a TMZ.com poll that compared the two songs and 65% of voters believed that Legend's "Maxine's Interlude" is a rip-off of Stokes' "Where Are You Now". A year later, Legend confirmed that he settled out of court with Stokes for an undisclosed amount. Also in 2011, Legend completed a 50-date tour as a guest for British soul band Sade. In the San Diego stop, Legend confirmed that he was working on his next studio album and played a new song called "Dreams". Later, via his official website, he revealed the official title of the album to be Love in the Future, and debuted part of a new track called "Caught Up". The album has been executive-produced by Legend himself, along with Kanye West and Dave Tozer – the same team who worked on Legend's previous albums Get Lifted, Once Again, and Evolver. Legend has stated that his intention for the record was "To make a modern soul album – to flip that classic feel into a modern context." In 2014, Legend partnered with the rapper Common to write the song "Glory", featured in the film Selma, which chronicled the 1965 Selma to Montgomery marches. The song won the Golden Globe Award for Best Original Song as well as the Academy Award for Best Original Song. Legend and Common performed "Glory" at the 87th Academy Awards on February 22, 2015. Legend released his new album Darkness and Light, with first single "Love Me Now", on December 2, 2016 with songs featuring Chance the Rapper and Miguel. In April 2017, Crow: The Legend, a short animation film, premiered its prologue at the Tribeca Film Festival. Legend was cast in the title role as the character Crow. He also served as executive producer for the project and performed the original song "When You Can Fly". The film won at thirteen different film festivals including the LA Film Festival where it made its North American premiere in 2018. The film won Best Animation VR Experience at the 2018 Raindance Film Festival and received nomination for Best Virtual Reality Production at the 46th Annual Annie Awards. On December 19, 2017, NBC announced that Legend had been cast in the title role in the live concert production of Jesus Christ Superstar at the Marcy Avenue Armory in Williamsburg, Brooklyn. The production was broadcast live on NBC television on April 1, 2018 (the date of Easter Sunday that year in Western Christianity). On May 8, 2018, Google chose John Legend as one of the six new Google Assistant voices. In May 2007, Legend partnered with Tide laundry detergent to raise awareness about the need of families in St. Bernard Parish (Chalmette, Louisiana), one of the most devastated areas hit by Hurricane Katrina; he spent a day folding laundry at the Tide "clean start" mobile laundromat and visited homes that Tide was helping to rebuild in that community. On July 7, 2007, Legend participated in the Live Earth concert in London, performing "Ordinary People". After reading Professor Jeffrey Sachs' book The End of Poverty, Legend started his Show Me Campaign in 2007. In this campaign, Legend called on his fans to help him in his initiative for residents in Bosaso Village, Somalia and non-profit organizations partnered with the campaign. Also in 2007, Legend was the spokesman for GQ magazine's "Gentlemen's Fund", an initiative to raise support and awareness for five cornerstones essential to men: opportunity, health, education, environment, and justice. In October 2007, Legend became involved[clarification needed] with a project sponsored by The Gap, a retail clothing store chain in the United States. On January 22, 2010, he performed "Sometimes I Feel Like a Motherless Child" on the Hope for Haiti Now telethon show. On September 8, 2010, John Legend joined the national board of Teach For America. Legend also sits on the boards of The Education Equality Project, the Harlem Village Academies, and Stand for Children. He serves on the Harlem Village Academies' National Leadership Board. On September 9, 2010, he performed "Coming Home" on the Colbert Report as a tribute song for the end of combat operations in Iraq, and for the active troops and the veterans of the United States Armed Forces. In 2011, he contributed the track "Love I've Never Known" to the Red Hot Organization's most recent album Red Hot+Rio 2. The album is a follow-up to the 1996 Red Hot+Rio. Proceeds from the album sales were donated to raise awareness and money to fight AIDS/HIV and related health and social issues. On March 6, 2012, John Legend was appointed by the World Economic Forum to the Forum of Young Global Leaders. Later that year, Legend stopped by Children's Hospital Los Angeles for a surprise visit and acoustic performance as a part of Get Well Soon Tour. On June 1, 2013, Legend performed at Gucci's global concert event in London whose campaign, "Chime for Change", aims to raise awareness of women's issues in education, health and justice. At a press conference before his performance, Legend identified himself as a feminist saying, "All men should be feminists. If men care about women's rights the world will be a better place." In 2016, Legend co-signed a letter to the United Nations Secretary-General Ban Ki-Moon calling for a more humane drug policy, along with people such as Richard Branson, Jane Fonda and George Shultz. The following year, Legend appeared on Salem State University's speaker series and was recognized by Voices Against Injustice (formerly known as the Salem Award Foundation for Human Rights and Social Justice) as the inaugural Salem Advocate for Social Justice. Also in 2017 Legend donated $500,000 to Springfield City School District to renovate an auditorium, which is named in his honor, within the Springfield Center of Innovation. He performed at the John Legend Theater on October 9, 2016. In 2018, he starred in an animated virtual-reality short film written and directed by Eric Darnell, titled Crow: The Legend, together with Oprah Winfrey, telling a Native American origin tale. Legend met model Chrissy Teigen in 2007 when she starred in the music video for his song "Stereo". They became engaged in December 2011. They were married on September 14, 2013, in Como, Italy. The 2013 song "All of Me" was written and is dedicated to her; the music video was reportedly displayed at their wedding. The couple's first child, a daughter was born in April 2016. On November 21, 2017, Teigen announced via Instagram that she was pregnant with the couple's second child, and on January 28, 2018, that their second child would be a boy. He was born in May 2018. Both children were conceived via in vitro fertilization. 2017 Carpool Karaoke: The Series Himself Episode: "Alicia Keys & John Legend"
^ Platon, Adelle (June 11, 2017). "John Legend Wins Tony Award for 'Jitney,' is One Emmy Away from EGOT Status". Billboard. Retrieved June 12, 2017. ^ Wanshel, Elyse (September 10, 2018). "John Legend Becomes First Black Man To Reach EGOT Status". Huffington Post. Retrieved September 11, 2018. ^ Scheibelhut, Ashley (September 11, 2018). "John Legend Is First Black Man To Achieve EGOT Status". Chill Magazine. Retrieved October 9, 2018. ^ "John Legend Fans On Iseecolor". Mingle City. Archived from the original on October 6, 2014. Retrieved May 22, 2014. ^ "Gold & Platinum Searchable Database – August 09, 2014". RIAA. Archived from the original on October 27, 2013. Retrieved August 9, 2014. ^ "Gold & Platinum Searchable Database – October 29, 2014". RIAA. Archived from the original on September 24, 2015. Retrieved October 29, 2014. ^ "John Legend & The Roots feat. Common & Melanie Fiona – Wake Up Everybody". Nah Right. July 16, 2010. Archived from the original on April 29, 2014. Retrieved August 9, 2014. ^ McGee, Tiffany. (July 16, 2010) First Listen: John Legend & the Roots Want You to 'Wake Up!' – The Roots, Music News, John Legend. People.com. Retrieved on May 26, 2011. ^ "Education Secretary Urges Howard Graduates to Seek Their Passion and to Serve – Howard University Newsroom". Howard.edu. March 16, 2000. Archived from the original on May 16, 2012. Retrieved May 14, 2012. ^ Dave McNary, "Ariana Grande, John Legend to Perform Title Track for 'Beauty and the Beast'", Variety, January 11, 2017. ^ "Watch the Trailer For 'Crow: The Legend' Starring John Legend and Oprah Winfrey". Billboard. November 13, 2018. Retrieved December 30, 2018. ^ "'Crow: The Legend' Qualifies for the 2019 Academy Awards". Animation Magazine. September 17, 2018. Retrieved December 30, 2018. ^ Cite error: The named reference Legend was invoked but never defined (see the help page). ^ Aiello, Chloe (May 8, 2018). "Singer John Legend will be one of six new voices for Google's smart assistant". CNBC. Retrieved May 10, 2018. ^ "Legend to perform Dec. 24 at high school in Springfield". highbeam.com. Archived from the original on October 29, 2017. ^ "The Colbert Report | Colbert Nation | Comedy Central". Colbert Nation. Archived from the original on March 21, 2014. Retrieved August 9, 2014. ^ "Strombo | The 2012 World Economic Forum Honours 3 Canadians As Young Global Leaders ... Including George". CBC Television. March 6, 2012. Archived from the original on April 8, 2012. Retrieved May 14, 2012. ^ "A Legendary Visit | CHLA". wetreatkidsbetter.org. Archived from the original on February 9, 2015. Retrieved November 20, 2016. ^ "John Legend wins a social justice award and leads an 'All of Me' singalong at Salem State - The Boston Globe". ^ "Ohio theater named for John Legend nears completion". The Blade. June 26, 2016. Retrieved January 10, 2017. ^ "Chrissy Teigen, John Legend Recreate Iconic 'Spider-Man' Kiss On 'Lip Sync Battle'". May 8, 2017. ^ Stryker, Sam. "Chrissy Teigen Just Announced She's Pregnant In The Cutest Way Possible". BuzzFeed. Retrieved November 21, 2017. ^ "OMG, Chrissy Teigen Just Announced She's Pregnant In The Most Chrissy Teigen Way Possible". Buzzfeed.com. Retrieved November 22, 2017. ^ "Chrissy Teigen Announces She's Having a Baby Boy With John Legend". Retrieved May 4, 2018. ^ White, Chelsea (May 17, 2018). "Chrissy Teigen and John Legend Welcome Baby Number 2: 'Somebody's Herrrrrrre!'". People. Retrieved February 1, 2019. ^ Gann, Jen (April 4, 2018). "Chrissy Teigen Doesn't Feel Like an Expert Mom". The Cut. Retrieved February 1, 2019. ^ "Crow: The Legend (2018)". 2018. Retrieved November 25, 2018. "Estelle talks relationship with John Legend, American lifestyle and more [NFTR]". GRM Daily.